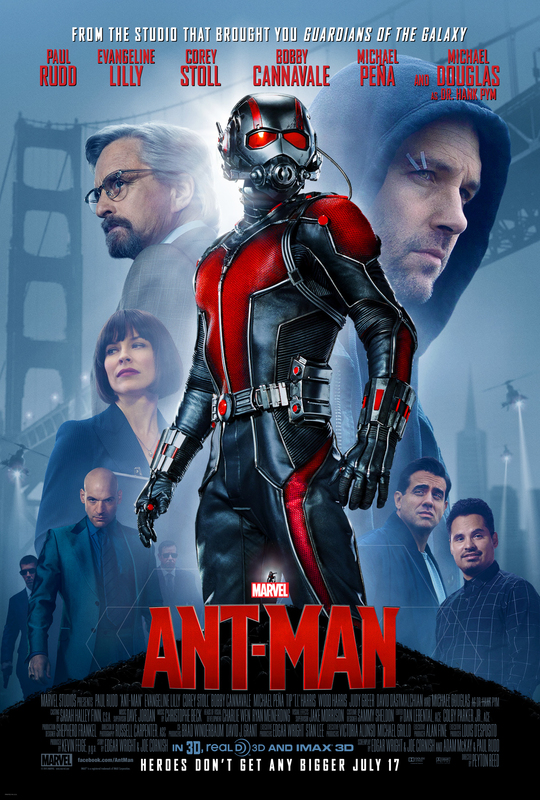 Joel’s review of Ant-Man (2015) | Tales From The Ipe! Saturday was a busy day. We atrended a funeral in the morning for someone’s father up in Rockland, NY. In the late afternoon, after the interment service at the cemetery, we grabbed some lunch at an Indian restaurant in Teaneck. After finally getting home, we rested for a few hours, then went see Ant-Man in 3D. Meanwhile, the original Ant-Man Hank Pym (Michael Douglas) is an old man now, and in conflict with the man who has taken over Pym Technologies — Darren Cross (played by Corey Stoll.) Although Pym has been hiding Pym Particles (they allow atoms to change size), Darren Cross plans to figure out how to both develop and weaponize Pym Particles. It may all sound confusing, but it’s all fairly straightforward. The film is pretty enjoyable. It’s certainly going for laughs vs grim dark drama. And while using Pym Technology for evil was important, you didn’t have that “the fate of the world hangs in the balance” that is often used. Honestly, I think we all need a break from world-ending catastrophes. Did I like this film? Yes. It didn’t move me or anything. I will admittedly say that it didn’t impress me as much as Guardians of the Galaxy last summer, but this was pleasantly entertaining. The funny moments were good, and the supporting cast was good. Especially the ants — they were cool. And there are a number of subtle MCU callbacks, including a cameo from one particular Avenger. It’s a comic book story, it’s funny and entertaining, and the wife and kids enjoyed it. It’s not a home run, but I’m good with a double or triple once in a while. This entry was posted in Entertainment and tagged ant-man, avengers, marvel, marvel cinematic universe, mcu, movies, paul rudd. Bookmark the permalink.